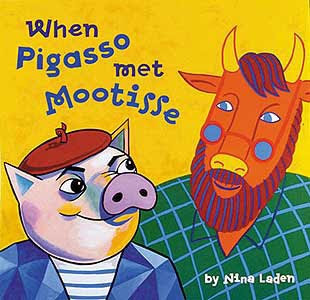 If you haven't already, you REALLY need to check out When Pigasso Met Mootisse by Nina Laden. 2. The students will define friendship and brainstorm a list of attributes of a good friend. 3. The students will create a portrait of a friend they would want to have (not a specific person) in a style that combines Cubism and Fauvism. 4. The students will write at least five words/phrases that describe a friend they would want to have. 5. The students will apply knowledge of warm and cool colors in the creation of their drawings. How do you know if someone is your friend? Next, the teacher will ask the class to brainstorm qualities of a good friend. As the qualities are listed, the teacher will record them on the board. The teacher will explain to the students that for their assignment, they need to think of what qualities they want in a friend. The teacher will tell the students that they will be drawing a portrait of a friend they would want to have (a generic friend, not a specific person). The teacher will remind the students that Pigasso and Mootisse were based on real artists from history, Pablo Picasso and Henri Mattisse. The teacher will tell the students that Picasso was one of the founders of Cubism (more than one side of something is shown at the same time) and that Matisse was a Fauve (Fauve means wild beast, called that because of the bright, wild colors they used.) Both styles will be reflected in the portraits. The teacher will lead the students through the drawing of a Cubist portrait. 1. Ask the students to place their hand in the middle of their paper. Since your face is about the size of your hand, it is a good guide. The students will use their pencils to put a dot right above the middle finger and right below their palm. 2. Draw the outside shape of a face. An oval or egg shape will work fine since the portraits will be abstract. The dots are a guide to get the head big enough. The top and bottom of the oval should touch the dots. If students need a guid for how wide to make the shape, the width of their hand will work. 4. Add features to face in profile: side of nose, lips, eye brow, eye looking sideways, ear. 6. With any remaining time, show the students how to draw shapes for hair. Stress to the students not to shade in the hair or make individual strands, just the outline. This is where the students can make their "friend" a boy or a girl. Day 2: The teacher will quickly review the material covered on day 1. The students will choose at least 5 words of phrases that describe the kind of friend they would want to have (nice, honest, fun, etc.) and use a pencil to write them around their drawing. The students will use sharpies or black markers to trace over all of the lines they have drawn and the words that they wrote. When everyone is done tracing, pick up the markers and tell students to get their pencil again. Next, use the pencil to lightly draw lines dividing the head and background into more shapes. I suggest using a line on the paper as a starting point and drawing a straight line to the edge of another line for the face or to the edge of the paper for the background. Tell the students that every shape will be carefully colored in so they should not overdo it! If everyone finishes early, start the process described for Day 3. Day 3: The teacher will remind the students that the first part of the drawing was inspired by Cubism and the colors will be inspired by Fauvism. The teacher will review warm and cool colors with the students and tell them that they will use warm colors for the face and hair and cool colors for the background. The teacher will demonstrate applying color with crayon to a drawing. The teacher will also remind the students that the colors don’t have to make sense. A color can be used more than once but two shapes of the same color should not touch. Here are some of the results! You can view the whole exhibit in our Artsonia gallery! I love the lesson! Do you think I could do this lesson with MS girls? I'm looking a lesson on friendship. Thanks. Oh sure! I think it (or something similar) would work great with middle school! It's a really funny book! I love this carefully thought out and structured for success lesson. I do a literature theme on friendship at the start of each school year and this would fit in perfectly. Later in the year we teach a series of artist appreciation lessons and Matisse and Picasso are tow of the artists I teach! I keep trying to create a Picasso sculpture lesson of found objects inspired by some of his like the gorilla and bicycle bull. Do you have nay thoughts on that? Not too long ago, I saw a blog post where students made small scale animal sculptures out of found objects like small boxes, spools, buttons, and wires. I wish I could remember where I saw it because it might be helpful!